Dutch oven versus hearth baking: It's a draw. One batch was baked in Lodge Dutch Ovens at 475 dF for 50 minutes (30 covered, 20 uncovered). The other batch was baked on a baking stone with my usual oven steaming method at 460 dF with steam for 15 minutes, then at 435 dF convection bake for 30 minutes. The DO loaves are the boules. The hearth loaves are the bâtards. At least in my electric home oven, these two methods yield very similar, equally satisfactory results. 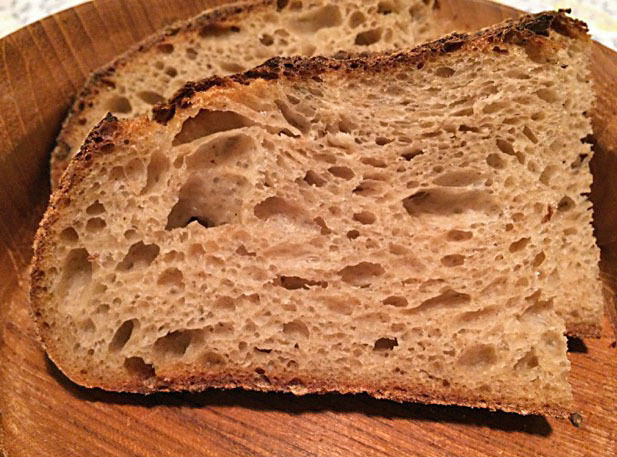 I would not say there is much difference in oven spring, crust consistency, crumb structure or bread flavor. Read more about Dutch oven versus hearth baking: It's a draw. Having heard the stories home-millers tell about the superior flavor of their breads, I finally bought a Mock Mill attachment for my KitchenAid mixer. I have milled both rye and wheat flours with this mill and used them in breads with around 30% whole grain flours. The breads were very good, but I honestly couldn't say they were superior to those made with commercial flours of good quality. For the first time today I baked a loaf that is 75% whole wheat. 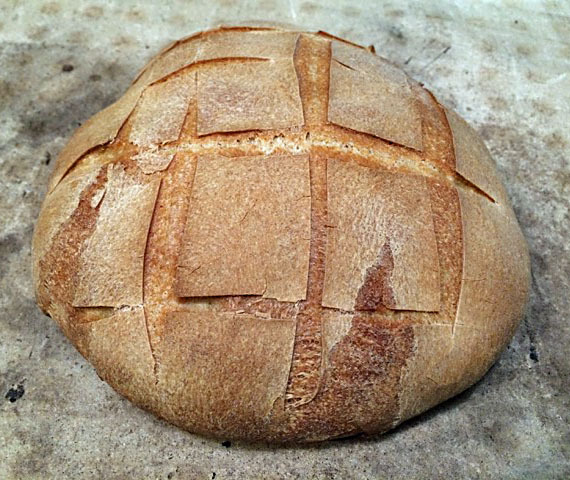 This is a bread from Forkish's Flour Water Salt Yeast. My only modification to the formula was to leave out the instant yeast. The wheat used was a Hard Red Winter Wheat from Palouse Farms in Washington State. The mill was set to a very fine setting, and I was pleased at how fine it mills. The dough, as it bulk fermented, was surprisingly soft and extensible - much more so than the KAF and Central Milling WW flours I have used. I emailed Palouse to ask for the Protein content of this wheat, and they promptly replied that it was 11%. I was also amazed to observe that fermentation seemed to proceed much faster than with other flours. This is a bread I expect to take 4-5 hours to bulk ferment. It was fully fermented in 3 hours. Although Forkish calls for this bread to be baked in a Dutch oven, I baked it as a hearth loaf - 15 minutes at 450 dF with steam, then 30 minutes at 435 dF convention-bake. The crust was crunch and nutty-flavored. 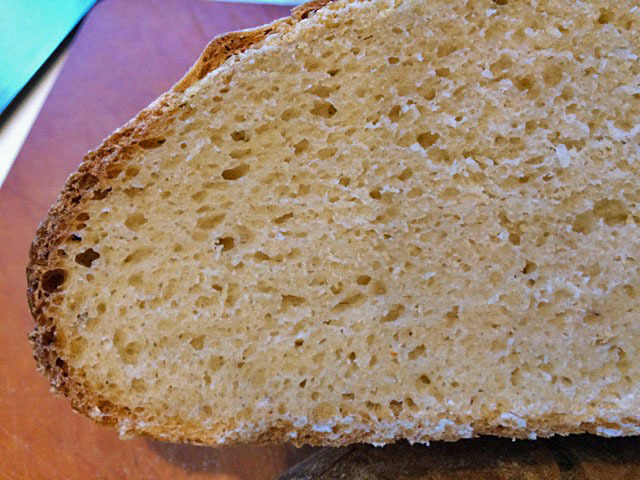 The crumb was moist and tender - amazing light and airy for a 75% Whole Wheat loaf. The flavor was wheaty with a bit of sweetness. It was delicious plain and also with a thin spread of sweet butter. 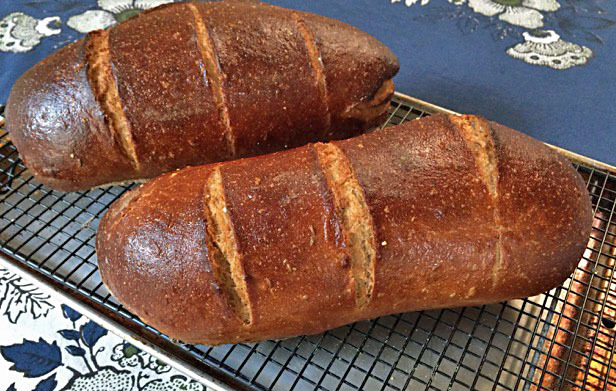 I have made this bread before with Central Milling Fine Organic Whole Wheat, and it was very good. 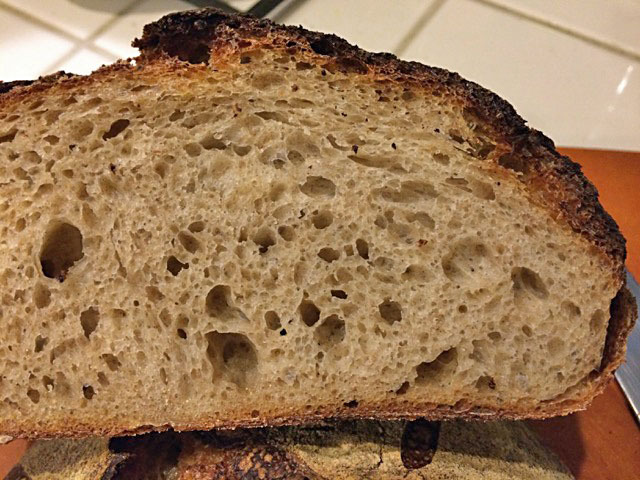 I do think it is a bit better with the fresh, home-milled flour, but not dramatically better. Again, the bread made with CM flour set a pretty high bar. The Mock Mill is easy to use, and I am impressed with how fine it grinds. 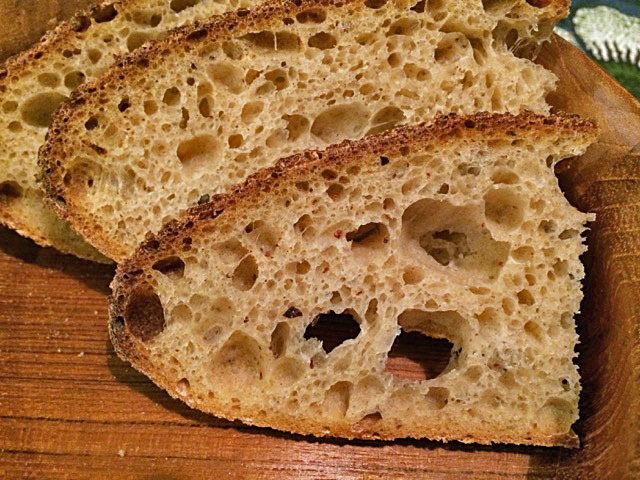 I'm looking forward to baking other breads with other home-milled grains. I have also bought a No. 40 flour sifter, and will be making some high-extraction flours. Lots of new bread baking adventures ahead! 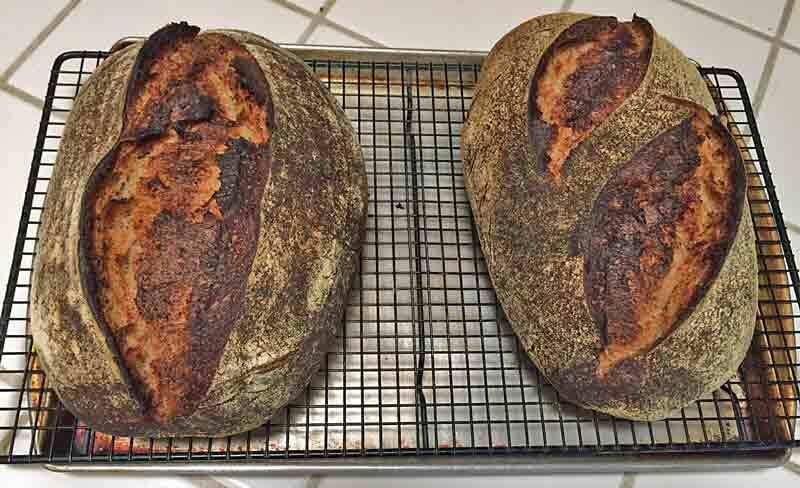 By the way, I also make a couple loaves of San Joaquin Sourdough with home-milled rye and whole wheat. It was also maybe a bit tastier than usual, but I am not really sure. Any comments or pointers from more experienced home millers would be very much appreciated. 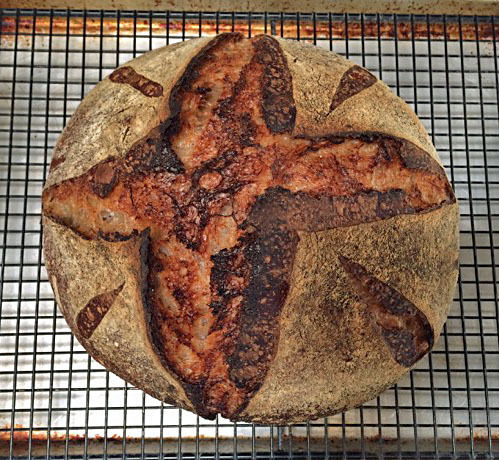 When I started baking sourdough breads, Susan Tenny's “Wild Yeast Blog” was, along with The Fresh Loaf, a major source of inspiration. Susan was also very active on The Fresh Loaf as “susanfnp.” Well, sadly, Susan has not kept up her blog, but it does remain accessible and worth a visit. In November, 2007 Susan blogged on a somewhat accidental bread (You just will have to read her blog to understand.) It was a 50% semolina bread with currents, pine nuts and fennel seeds. 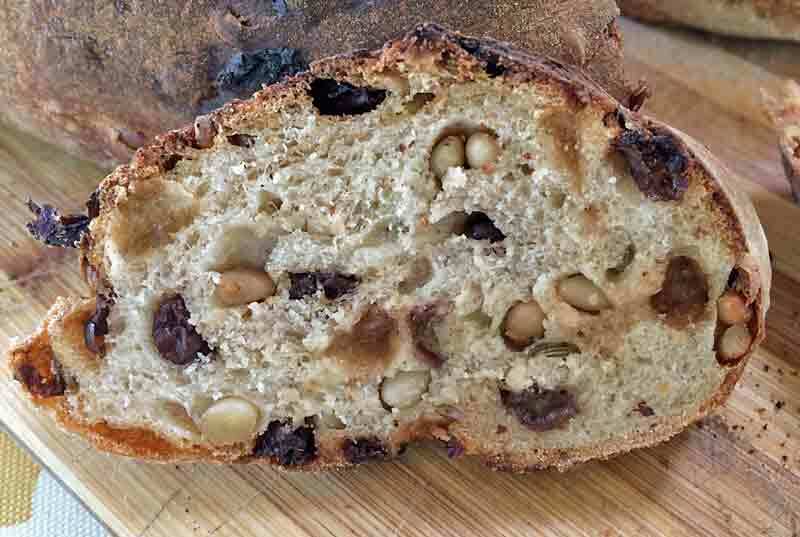 I was starting to explore sourdough breads with various nut/dried fruit combinations at the time, so I gave this one a try. I liked it a lot, although my wife doesn't like fennel or pine nuts as much as I do. So, I only made this bread the one time. Today, I attended a pot luck at a home that has a very large wood-fired oven. 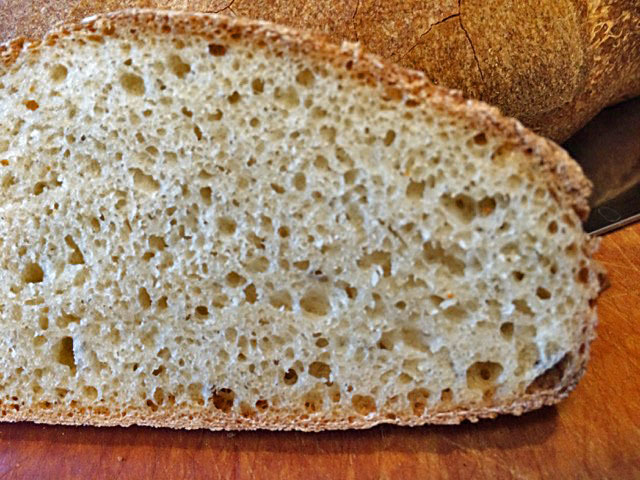 The group is mostly Italian, so Susan's semolina bread came to mind as one they would enjoy. 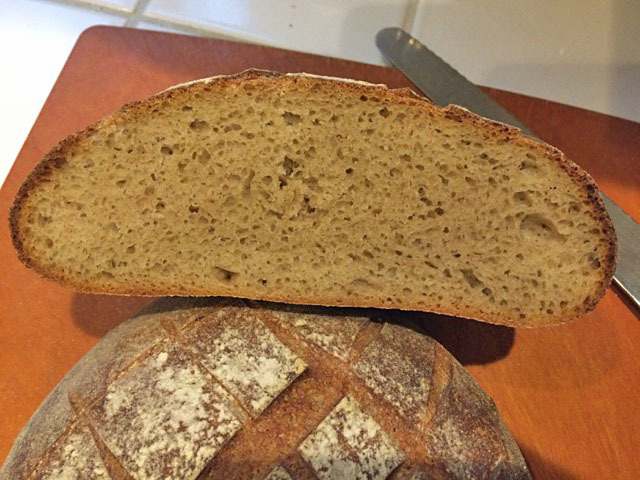 I have had good success with an “Italian Bread” based on my San Joaquin Sourdough, so I used that approach rather than Susan's for this formula. I know the table above does not fit current BBGA conventions. So sorry. I hope this doesn't place my membership at risk. Hydration is 73%, taking into account the levain. The liquid levain is my usual 100% hydration levain made with a flour mix of 70% AP, 20% Whole Wheat and 10% Whole Rye flours. 9% of the total flour is pre-fermented. 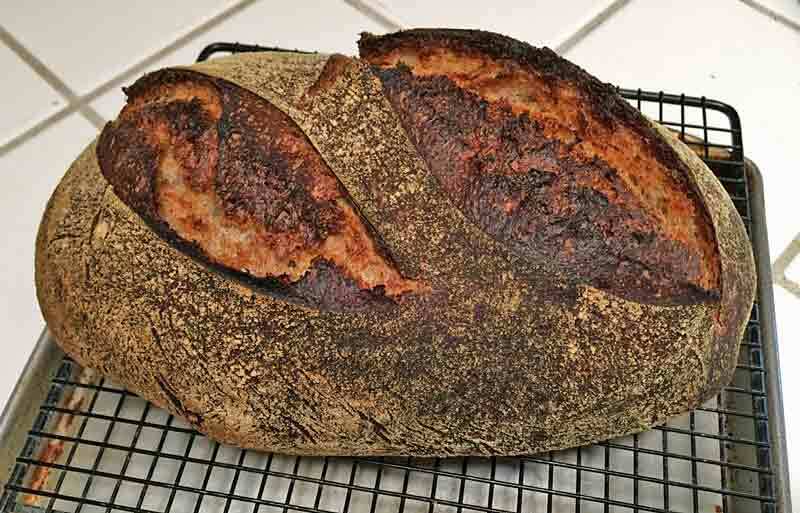 I generally mix the levain late at night and ferment it a 70-76ºF overnight, and mix the final dough in the morning. If I mix the levain early in the day, I ferment it then refrigerate it until an hour or so before mixing the final dough. If it is still cool, I compensate by using warmer water for the final dough. Dissolve the levain in the water using the paddle at slow speed. Add the flours and mix to a shaggy mass. Cover and rest (autolyse) for 20-60 minutes. Switch to the dough hook. Add the salt and mix at Speed 2 for 6-7 minutes or until there is moderate gluten development. Add the olive oil and continue to mix. The dough will first come apart and then reform a ball incorporating the oil. Add the currents, pine nuts and fennel seeds. Mix at low speed until they are evenly distributed – 1-2 minutes. Transfer the dough to a clean, lightly oiled bowl. 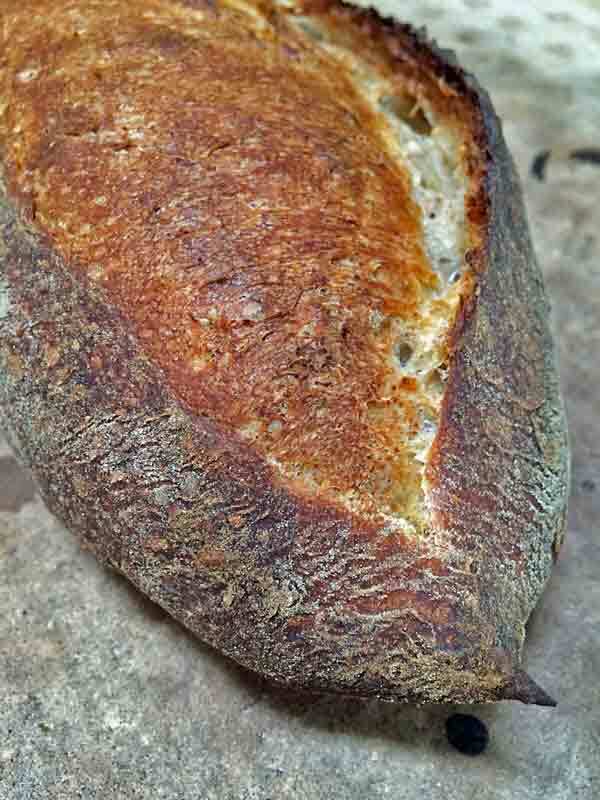 Cover and ferment at 70-76ºF for 3-4 hours with stretch and folds on a well-floured board at 50 and 100 minutes. The dough should have increased in volume by half and be filled with small bubbles and feel puffy, although it will also remain a bit sticky. Refrigerate the dough 8-12 hours. Divide the dough into four equal pieces. Pre-shape as balls, cover them, and let them rest for 1 hour. Proof on a couche for 45 minutes. Bake at 460ºF for 20-22 minutes with steam for the first 12 minutes. Transfer to a cooling rack. Cool thoroughly before slicing. This bread was very well received. Actually, they loved it. In my estimation, while the taste was really good, there is lots of room for improvement. The dough was underfermented. I haven't yet been able to adequately humidify this huge WFO when baking such a small amount of bread. My next step is to make this again, probably using the same formula, fermenting the dough more completely and baking it in my familiar home oven. Stay tuned! This was a busy baking week (for me). I baked for two potluck dinners and for my wife and me. Thursday, I had a committee meeting in the evening. I brought a San Joaquin Sourdough. I bake a SJSD for home as well, but also a 90% rye bread, my currently preferred base for cream cheese and lox. As you can probably tell from the dull crusts, our biggest problem was humidifying the huge oven with only four loaves loaded. On the other hand, this is the first bake I've done in this oven where the temperature was not too hot. So progress is being made. In a medium bowl, dissolve the active starter in the water. Add the flours and mix thoroughly. Transfer to a clean bowl and cover tightly. Ferment at 70-76ºF for 8-12 hours. It should have doubled in volume, have many bubbles on the surface and have a wrinkled surface. It should not have collapsed. 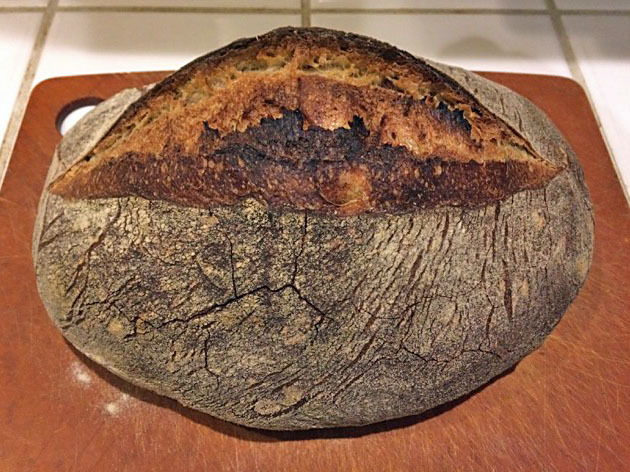 If you are not ready to use the levain when it is ripe, it can be refrigerated for up to a couple days. 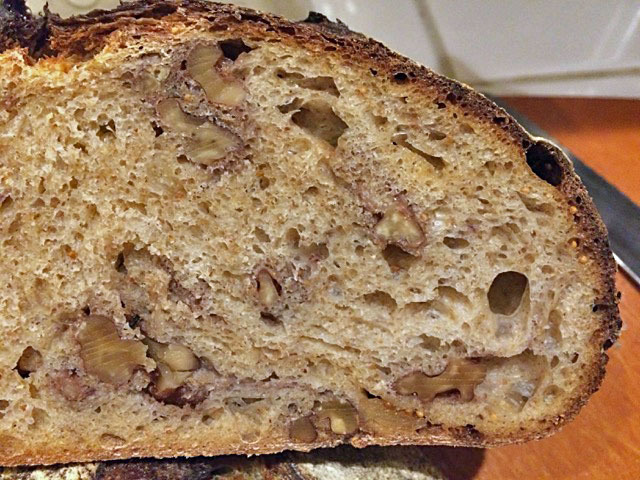 Toast the walnut pieces at 300ºF for 9 minutes. Cool completely. Cut the figs (Calmyrna, preferred) into pieces about marble-sized. Place in a sieve and rinse under running water. Place the sieve with the figs over a bowl to drain. In a large bowl, mix the flours and the water to a shaggy mass. Cover the bowl and let it rest (autolyse) for 20-60 minutes. Sprinkle the salt over the dough, then add the ripe levain in 4-6 portions. 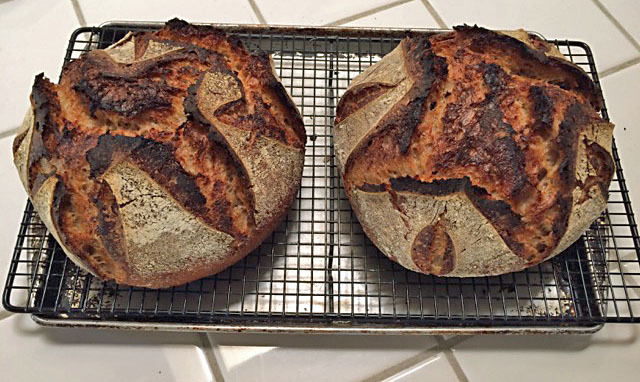 Using a spatula or your hands, mix the dough to evenly distribute the salt and levain. Note: My preferred method is by hand. I wear a food-grade “rubber” glove, dip the fingers in water frequently and use the French technique of squeezing the dough between my fingers many times, alternating with stretching and folding the dough. When you feel the ingredients are thoroughly mixed, transfer the dough to a clean, lightly oiled clean container and cover it. Bulk ferment for 50 minutes. Transfer the dough to a floured board. Stretch is to a rectangle about 12 X 18”. Distribute the figs and walnuts evenly over the surface of the stretched out dough. Fold the dough. Repeat the stretching and folding a few times to distribute the figs and nuts evenly. Return the dough to the bowl and cover. Bulk ferment for another 50 minutes. Do another stretch and fold and return the dough to the bowl. Bulk ferment for another 50-90 minutes. The dough should be well aerated. Transfer the dough to the board and pre-shape as a ball. Cover with a cloth and let the dough relax for 10-30 minutes. Transfer the loaf to a well-floured banneton or brotform. Note: flouring the banneton/brotformen with a 50/50 mix of AP and Rice flour works best to prevent the dough from sticking to the proofing basket. Place the loaf in the basket in a food-grade plastic bag or cover well otherwise. Let the dough relax and start proofing at room temperature for a half hour or so. Take the loaf out of the fridge but leave covered. With a baking stone on the oven's middle rack and your steaming apparatus of choice in place, pre-heat the oven to 500ºF for 45-60 minutes. Uncover the loaf and sprinkle it with semolina or cornmeal. Transfer the loaf to a peel and score as desired. Turn down the oven temperature to 460ºF. Steam your oven and transfer the loaf to the baking stone. Note: My method of oven steaming uses a 9” cast iron skillet filled with the kind of lava rocks used with gas grills. This is pre-heated along with my baking stone. The skillet sits off to the side on an oven rack below the one that holds the baking stone. To generate steam, I fill a perforated pie tin with a single layer of ice cubes. This is rested on top of the lava rocks just before I load the loaves onto the pizza stone. After 15 minutes, remove the steam apparatus. If you have a convection oven, switch to convection-bake at 435ºF. Otherwise, leave the oven at 460ºF conventional bake. Bake for another 30-35 minutes. Check the loaf after 30 minutes. If it is not fully baked but is getting too dark, turn down the oven temperature by 10ºF or so and bake until fully baked. The loaf is fully baked when the crust is darkly colored, tapping the bottom of the loaf gives a hollow sound and the internal loaf temperature is 205ºF or higher. Remove the loaf to a cooling rack and cool completely before slicing. I had made sourdough pita breads a few months ago with 50% whole wheat flour. They were much better than "store bought," as everything I had read led me to expect. I had experimented with two methods of shaping - rolling out versus stretching (like a pizza) - and thought rolling out had better results (a surprise). I also didn't allow any proofing time. I divided, shaped and baked. This time, I shaped all the pitas by rolling and allowed a rather brief proof period - about 10-15 minutes. I think this improved the puffing out of the pitas. 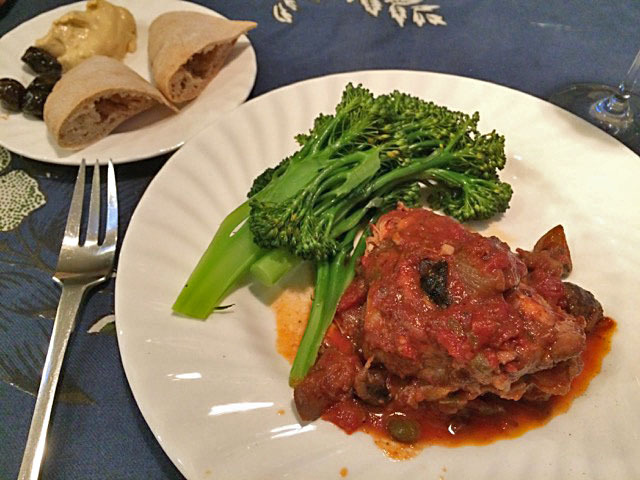 I had some, still warm out of the oven, with hummus and olives as appetizers for my dinner tonight (chicken cacciatore and broccolini). 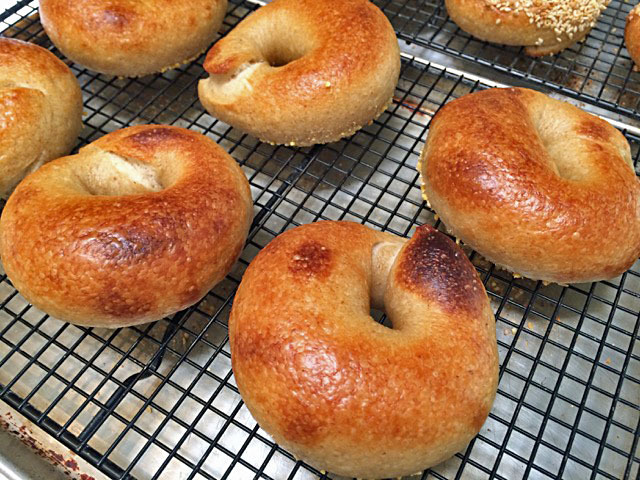 I've been meaning to make sourdough bagels for a long time. "Long time," in this case, means I found I had asked TFL member rossnroller to share his recipe back in 2010. I finally got around to doing it. 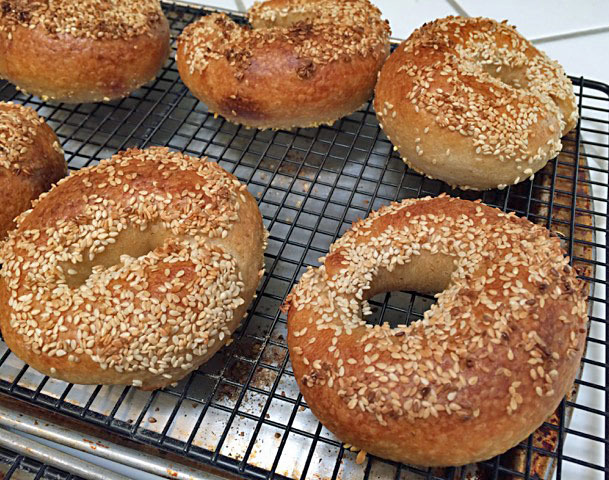 Although I didn't use Ross's recipe but converted Hamelman's bagel recipe in "Bread," which has worked well for me in the past, to a sourdough version. I think they turned out pretty well. 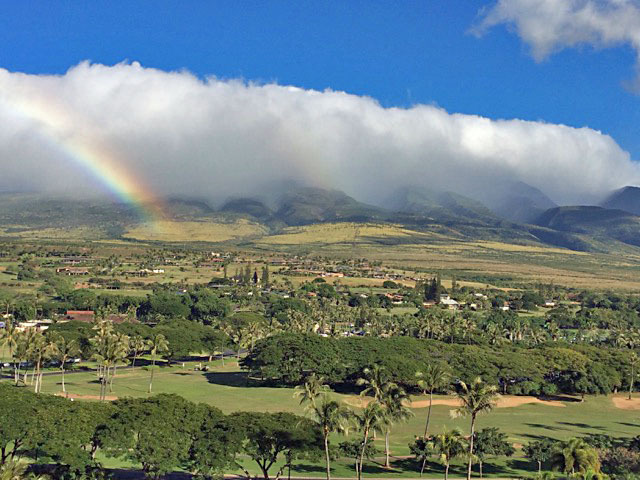 We just returned from a week and a half on Maui. It was a long-deferred first visit to that island, and I hope we visit again soon. We ate well. Hawaii is the home of "Asian Fusion" cuisine, and we ate a lot of it. The fish was simply fabulous - so much better than the very freshest fish I can get where I live. Because we found a fish market with wonderful fish, right off their own boat, I did cook in our rented condo a couple times. 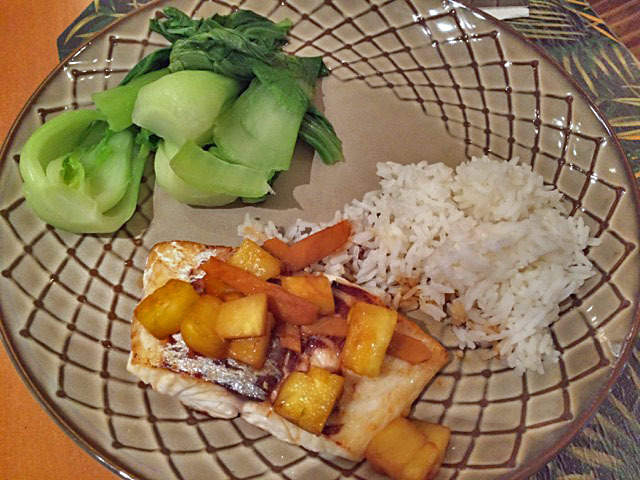 Opakapaka with a wine, soy, ginger, mango salsa. Pok choi and jasmine rice. Besides fish, we also enjoyed the tropical fruits. 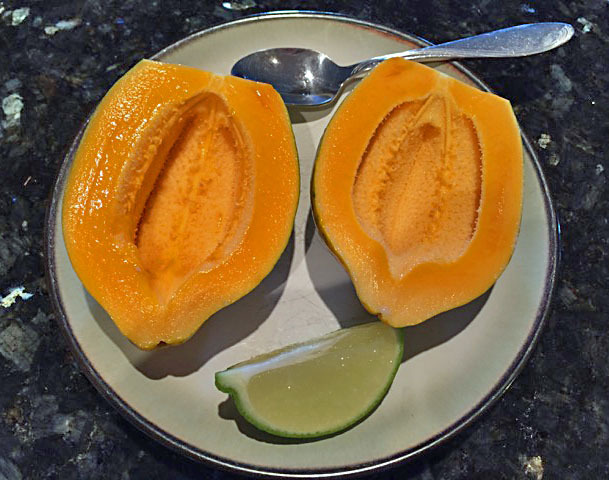 We had been to Hawaii twice before, but mangos were never in season. This trip, we had delicious local mangos and, even more, papayas. The bread scene on Maui is pretty sad, as far as I could discover. But then, except for Portuguese Sweet Bread, it's a rice-based diet. I suppose for native Hawaiians, poi (pounded taro root paste) is the main carbohydrate. Not that we grew tired of Hawaiian food - quite the opposite - but I was happy to make another kind of cuisine for a change. 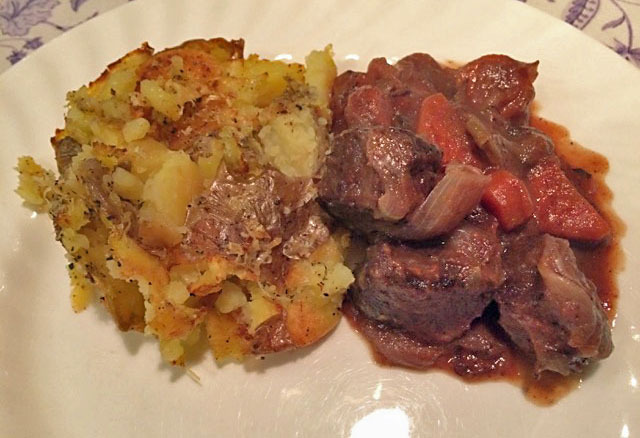 Winey beef stew with parmesan smashed potatoes. Happy to be home ... sort of. 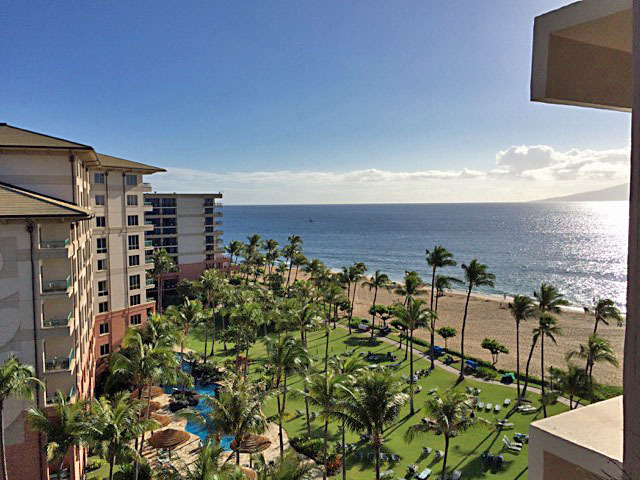 One of the views from our condo balcony. Read more about Checking in after travels. I started the Month loafing in Las Vegas. We had Thanksgiving in Henderson, NV this year. One of our sons teaches at UNLV. The deal was that the following weekend, said son and his wife (also a professor at UNLV) went off to a neuroscience conference in Hawaii, leaving my wife and me in charge of (Ha!) two granddaughters. So, we revisited parenthood for a week, complete with JuJitsu lessons, piano lessons, bass guitar practice sessions with rock and roll band, school pick-up and drop-off and cooking. Did I mention that the granddaughters are vegetarian? Now, this is the same son I had successfully infected with lactobacilli a few years ago, so the granddaughters are accustomed to having delicious home-baked sourdough bread. I baked 3 bakes in a week. 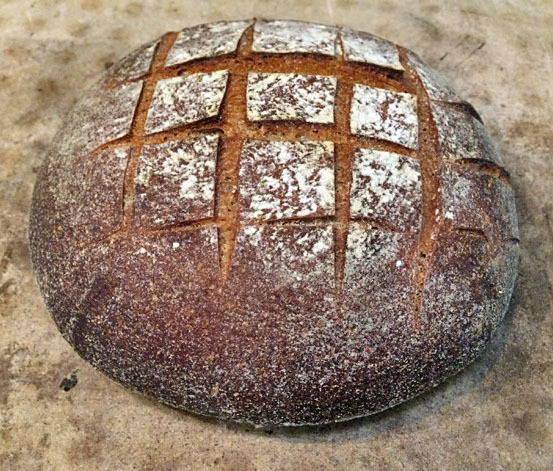 The bread I made all three times was Ken Forkish’s “Field Blend 2,” which is a pain au levin-type loaf made with a mix of AP, WW and rye. The reason I didn’t switch breads was that this one was so good. 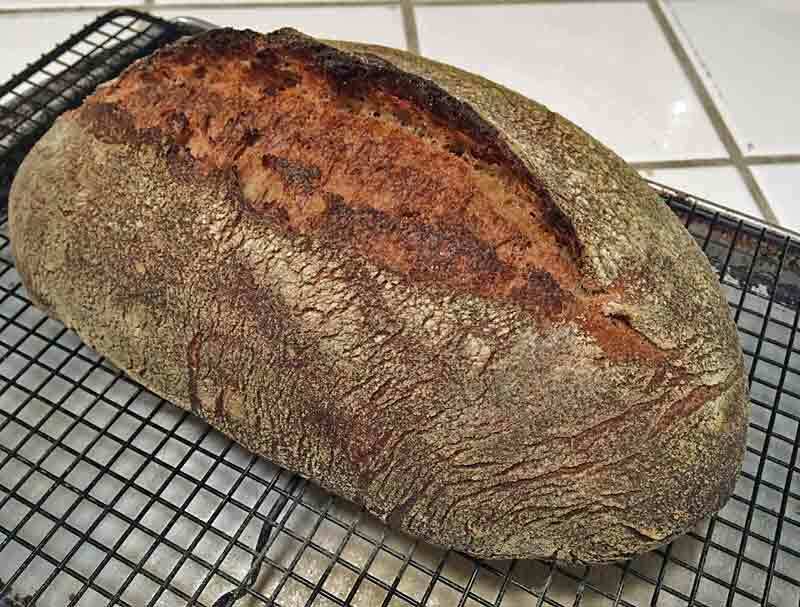 In fact, it was so good, I baked another loaf when we got back home to California. It was good again. Next month, the Fresno Jewish Film Festival film will be preceded by a dinner featuring “Jewish comfort food.” Now, that covers a whole lot of different dishes! Anyway, I let slip that I bake rye bread and got volunteered. This week, I made a couple loaves to get in the freezer. I’ll do another bake shortly before the dinner. The best part of the story is that the coordinator of the dinner is the daughter-in-law of the owner/baker of the Jewish bakery in Fresno when I was a child. He’s why I crave rye bread which is why I started baking bread. And his daughter-in-law wants me to teach her to make rye bread! That’s some kind of karma or something! 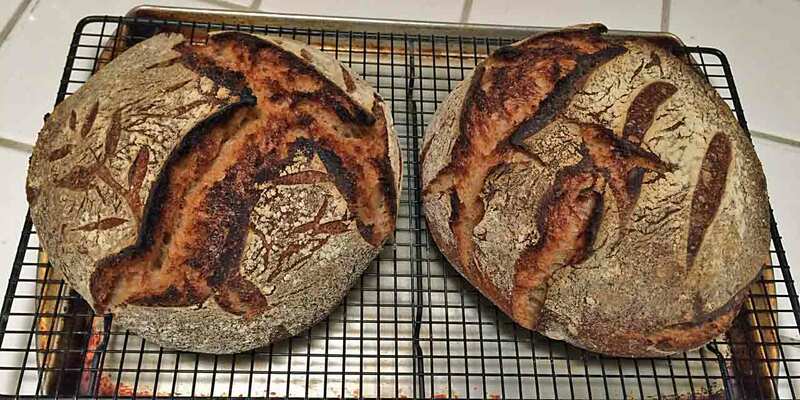 My last “project” for the month was two bakes of Hansjoakim’s “Pain au Levain with rye sour.” This has been a favorite of mine for several years. I have always followed Hansjoakim’s procedure which includes machine mixing and a single stretch and fold during bulk fermentation. 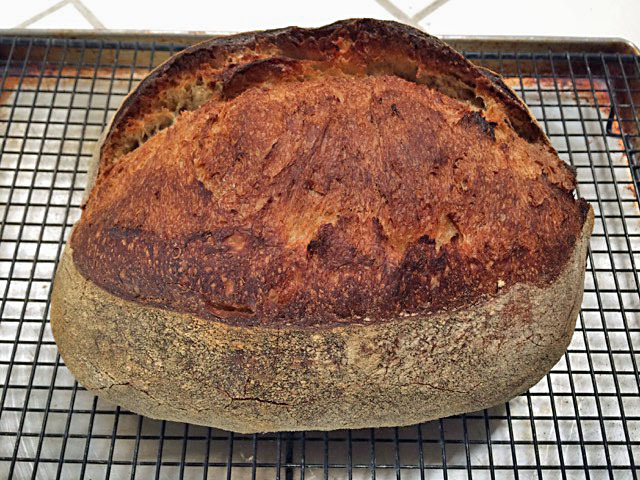 My recent very happy experiences with hand mixing sourdough breads made me wonder how some of the breads I have always machine mixed in the past would be hand mixed. So, I made loaves of Hansjoakim’s bread on two successive days, the first machine mixed and the second mixed by hand and stretched and folded four times at 30 minute intervals during bulk fermentation. All and all, the two bakes yielded pretty much identical results. I preferred the hand mixed version slightly. It had a more tender crumb and crunchier crust. It should be noted that, besides the difference in mixing, I also used a finer milled WW flour in the machine mixed loaf. I made some really tasty breads this month. A good way to close out the year. 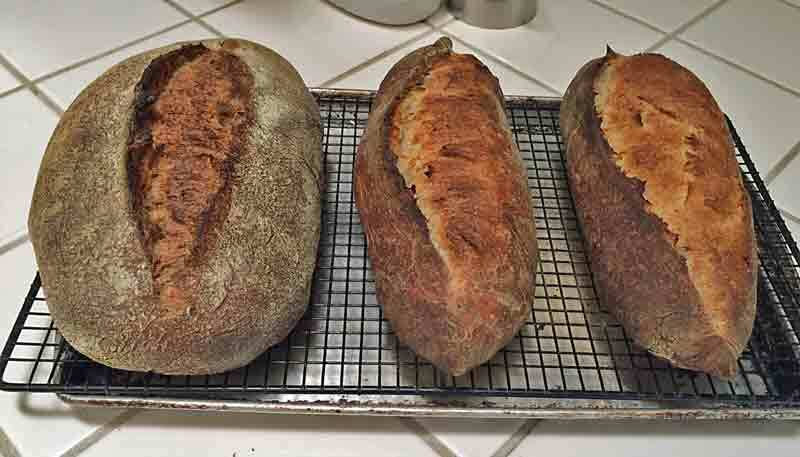 In the coming year, I already have two “dates” to bake with and teach a couple wannabe sourdough bakers. I’m looking forward to it. I have been less conspicuous on TFL this past year, but I have been gratified to see lots of collaborative problem solving happening. That is the heart of TFL, as far as I’m concerned. I think we participate in one of the interpersonally healthiest corners of the online universe, and Floyd deserves all the credit and a whole lot of appreciation for creating and maintaining it. So, a happy, healthy, peaceful and sane New Year to all and Happy Baking! This trial builds on what I learned from my first two trials. 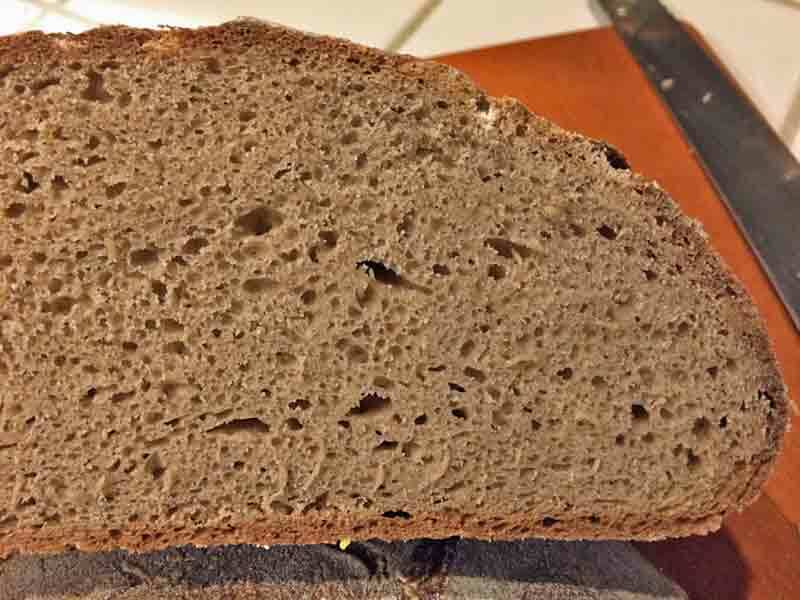 It is a bit of a detour in that I have made some changes that, I hope, result in a bread more to my current taste, even though it deviates from the breads of the old style in having higher hydration and whole grain flours. + I used Central Milling ABC flour (11.5% protein). * The starter should have been fed within the preceding 3 days. It may be refrigerated after the last feeding. Optionally, one can make extra starter with this formula to save, after being fermented, for use in generating the next sponge. Dissolve the firm starter in the water. Add the high-protein flour and knead until all the flour is well-hydrated. Ferment at 80ºF for 9-10 hours. Refrigerate overnight or up to 3 days. Sprinkle the salt over the dough and add the sponge in chunks. Mix at Speed 1 for 1 or 2 minutes until the ingredients are evenly distributed. Mix at Speed 2 for 10-12 minutes, until an medium window pane stage of gluten development. Cover the mixer bowl and let the dough rest for 20 minutes at 90ºF. Pre-shape as boule, cover with a damp cloth or plasti-crap and let rest at room temperature for 30 minutes. 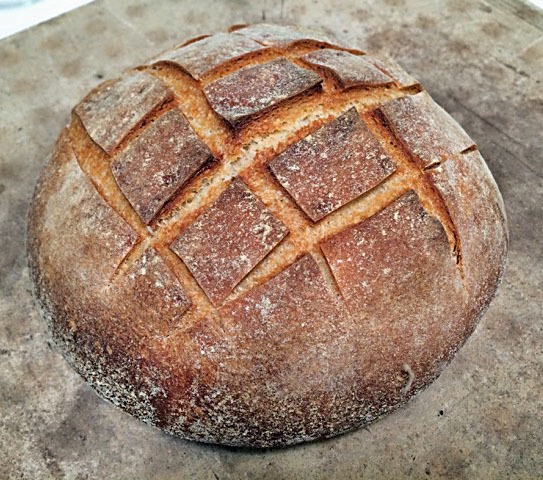 Shape as a boule and place in floured banneton. Place banneton in a plastic bag and seal. The journal article says the bakery proofed for 5-8 hours at 85-90ºF. Monitor the loaf frequently after 4 hours using the “poke test.” Proofing is sufficient when the dough is poked with a finger and springs back to fill the hole slowly. Place the banneton in the refrigerator for 8 to 24 hours. Pre-heat oven for 1 hour at 500ºF with baking stone and steaming apparatus in place. Just before baking, transfer the loaf to a peel and score as desired. Bake with steam at 460ºF for 15 minutes, then for another 25-30 minutes. (I did the second part of the bake with the oven set to 440ºF, Convection Bake. Remove to a rack and cool thoroughly before slicing. Okay. This is more that a “detour.” It's a different bread. It is a really good pain au campagne, I would say. The crust is chewy. 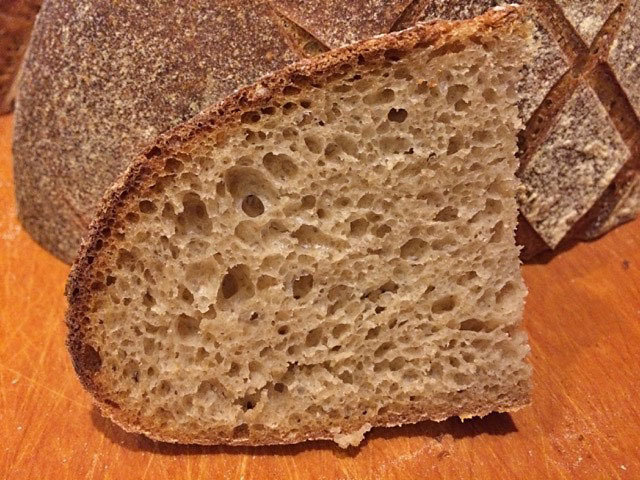 The crumb is tender. It is moderately sour – less so than I expected, actually. But it has a predominant sweet, wheaty, mellow flavor. I think there is a lot of lactic acid influence there. 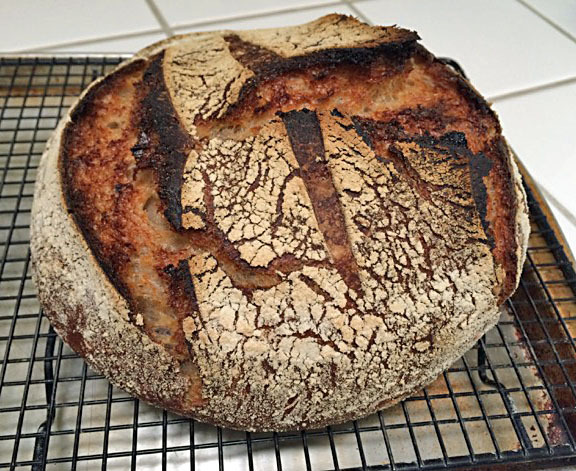 I will be getting back to my quest to replicate old-style San Francisco Sourdough, but this diversion produced a bread I am going to want to make again. Colombo, Parisian, Larraburu. These bakeries produced the bread that made “San Francisco Sourdough” unarguably the most iconic bread produced in America. They are all gone now, and while San Francisco is still (again?) 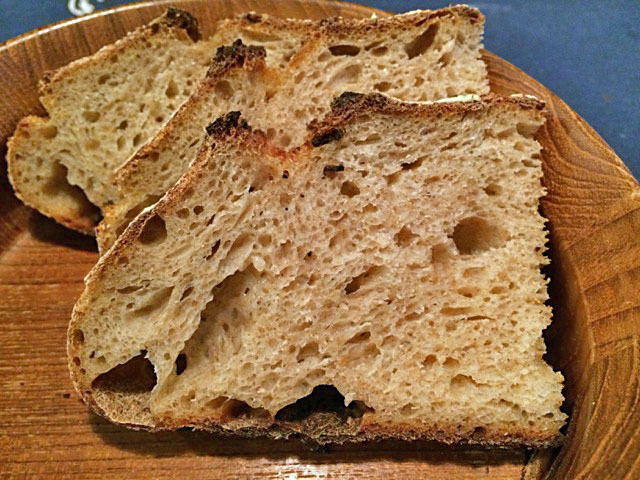 home to some amazingly delicious sourdough breads, the only place to get that old-style San Francisco Sourdough bread is at the Tadich Grill restaurant. Theirs is especially made by Boudin Bakery and is not available anywhere else. The methods used by those old bakeries are documented in the bread science literature. 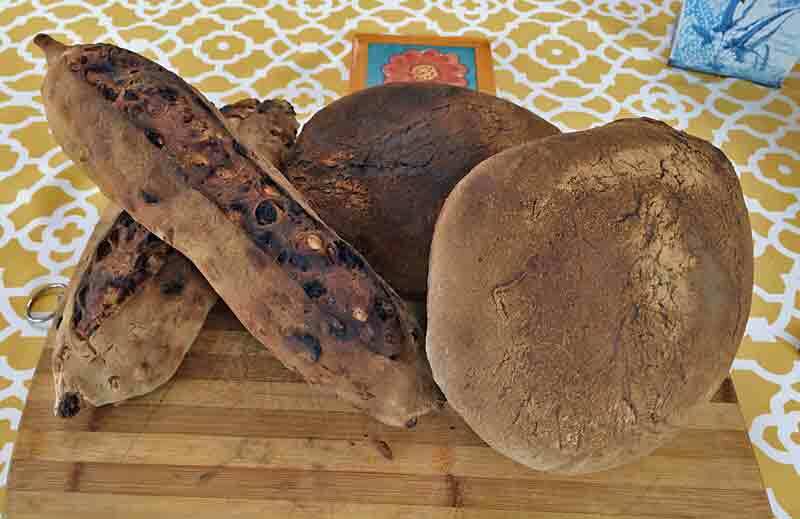 There were studies of the bacteriology of San Francisco Sourdough cultures published in the 1970's while those bakeries were still in business. The bakery formulas and methods were incidentally included in some of these articles. The methods were quite different from those prescribed in currently popular bread baking books which are modeled on French approaches largely, I think. 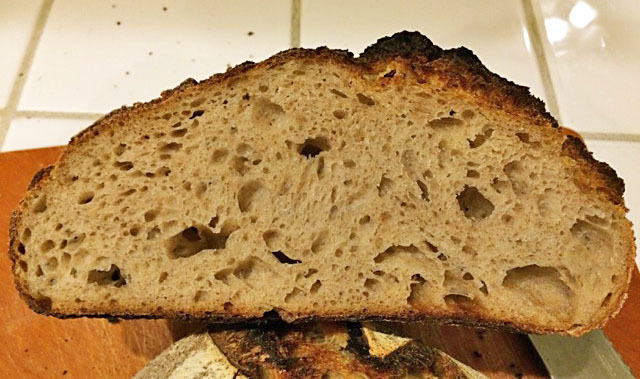 While those certainly produce great bread, they have very different crumb structures and flavor from the San Francisco Sourdoughs of the 1950 to 1975 era, which is what I grew up on and loved. 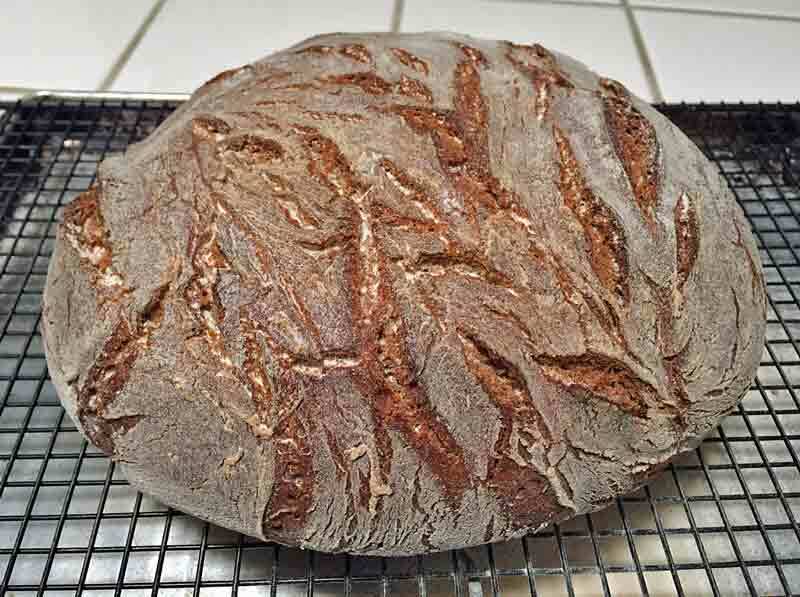 I have previously attempted to produce San Francisco-style Sourdough, and, while it made good bread, I have never closely followed the methods described in those articles. It's time I did so. + I used half KAF bread flour (12.5% protein) and half Central Milling ABC flour (11.5% protein) for Trial #1 and all ABC flour for Trial #2. Cover the mixer bowl and ferment the dough at room temperature for 1 hour. Pre-shape as a ball and let rest for 20-30 minutes, covered with a towel. 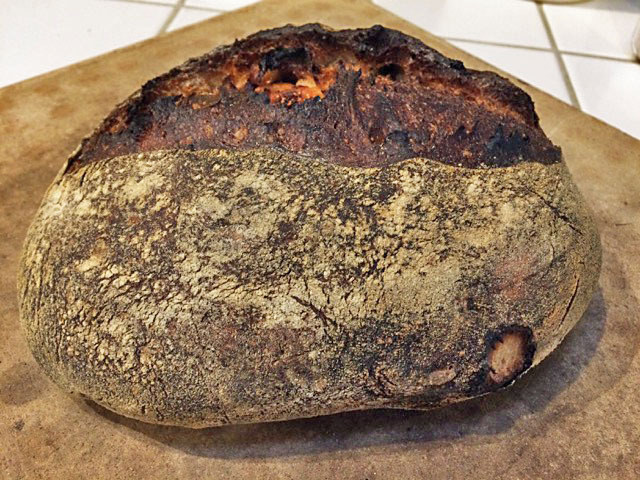 Shape as a boule or bâtard and proof on a couche or in a banneton for 4 hours at 105ºF and 96% humidity. Transfer to a rack and cool thoroughly before slicing. I fermented the sponge and proofed the loaf in my Brød and Taylor Proofing Box. For proofing, I put a bowl of water in the proofing box, along with a boule wrapped in bakers' linen and place on an inverted 1/4 sheet pan. At 3.75 hours, I took the loaf out. It was very puffy, possibly over-proofed. A “skin” had formed on the surface. The bowl of water had not provided a moist enough proofing environment. Next time, I will think about proofing in a covered container or in a banneton enclosed in a plastic bag. Consistent with over-proofing, the crust was rather pale and dull. The oven spring was modest with relatively little bloom. The crust was a bit tough, not crunchy nor chewy. The crumb was surprisingly even. 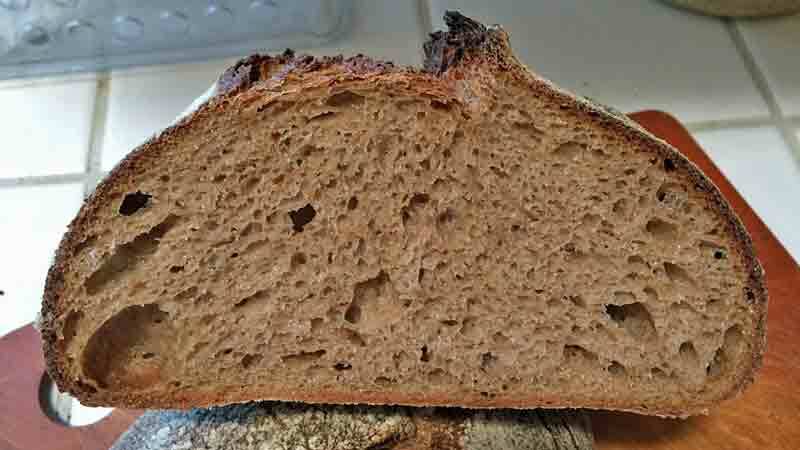 The flavor was good sourdough white bread – a little bit sweet with lactic acid flavors predominating and just a bit of acetic acid tang. Not bad bread but certainly not what I wanted to produce. 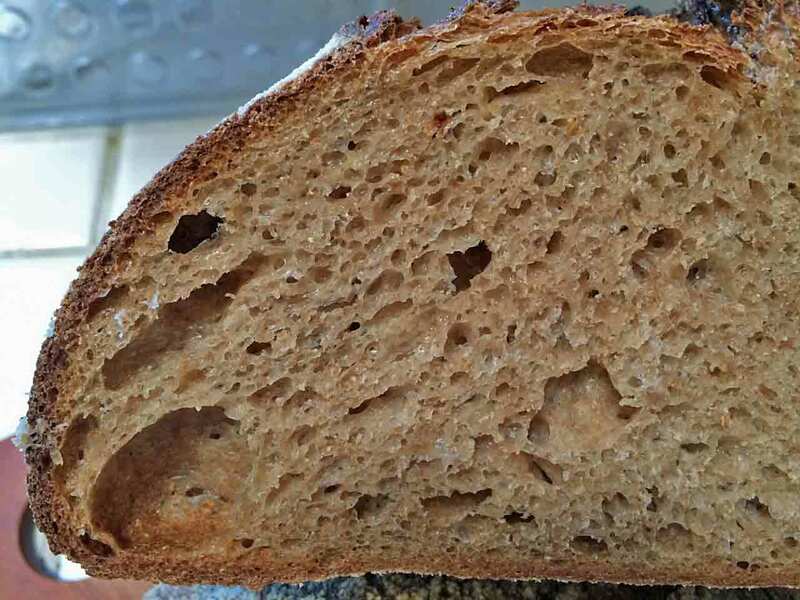 This second trial is my adaptation of slightly different procedure described in another journal article, the well-known 1970 Kline, Sugihara and McCready article with first documented the micro-flora population of San Francisco Sourdoughs. I used the same ingredients, changing the fermentation and proofing procedures. Mix at Speed 2 for 8-10 minutes, until an early window pane stage of gluten development. Cover the mixer bowl and let the dough rest for 20 minutes at 80ºF. Pre-shape as boule, put on a pie tin, place the tin in a plastic bag and let rest at room temperature for 30 minutes. The journal article says the bakery proofed for 6-8 hours at 85-90ºF. I proofed at 85ºF but found the loaf fully proofed after 5 hours. In hopes of enhancing acetic acid production, I chose to cold retard the loaf until the next day. Bake with steam at 460ºF for 15 minutes, then for another 25-30 minutes. The crust was darker than Trial bake #1. 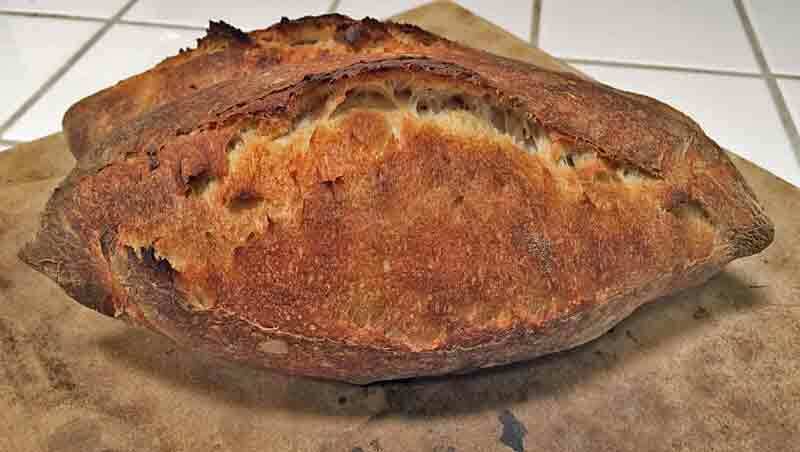 In fact, it was the color of the Parisian San Francisco Sourdough I remember. It is not as dark as the bread Boudin makes for Tadich Grill, which I would prefer. 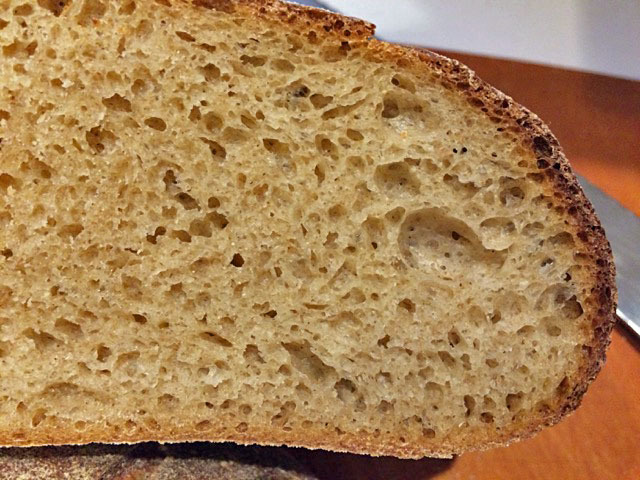 On slicing, the crumb is very compact, appropriate for a 60% hydration loaf. I have become so accustomed to breads made with higher hydration dough, this is startling. Nothing really wrong with it, just different. The aroma of the cut bread is mild. It isn't particularly sour. It smells like nice sweet pain au levain. On tasting, the crust is satisfactorily crunchy. It is mildly nutty. As I said, I prefer a darker crust. 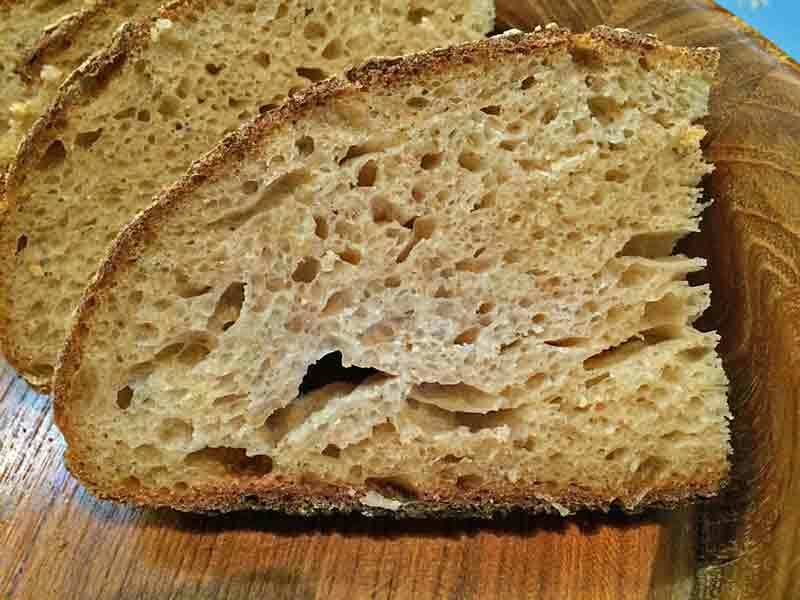 The crumb is surprisingly tender with just a mild chewiness. 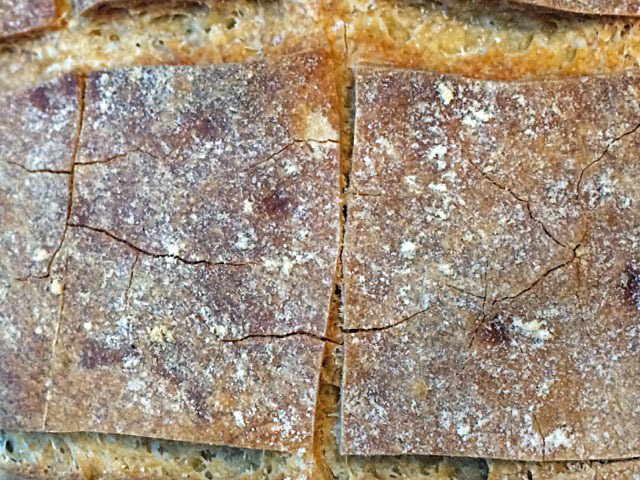 It does not have the shredability of classic San Francisco Sourdough. I'm not sure how to achieve that. The flavor is predominantly sweet and buttery. 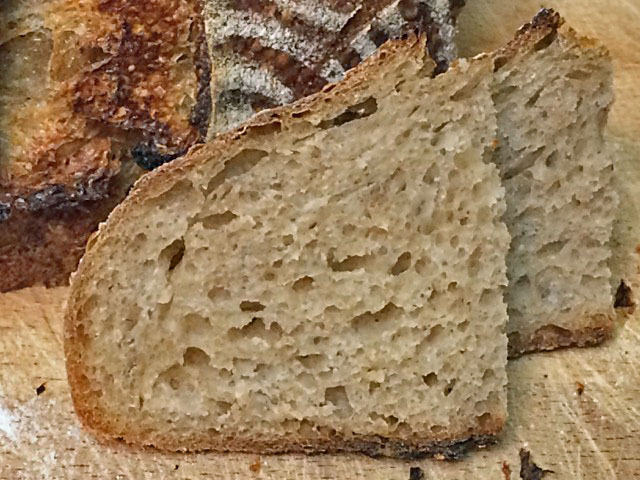 There is a mild but “correct” sourdough tang. It has that special flavor, which is not merely a bigger slug of acetic acid, but is a combination of flavor tones from both acetic and lactic acids. This bread is weighted more on the lactic acid side than my personal ideal. I am happy with Trial bake #2. Progress has been made, but there is more work to be done. I may increase the dough hydration a bit. I may fiddle with the fermentation temperature and the length of the cold retardation. At some point, I will surely add some whole grain flour. It may be that keeping the all white, high gluten flour firm starter going may improve the bread flavor over time. One can hope. Any ideas or suggestions from the TFL community would be appreciated.